President Barack Obama speaks about the Boston Marathon explosions on April 15, 2013 from the White House. 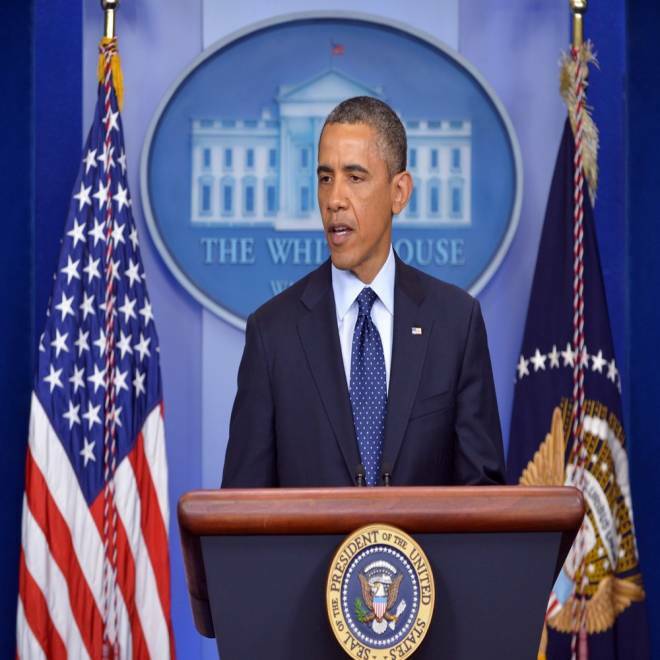 President Barack Obama vowed Monday evening to bring those responsible for the Boston Marathon explosions to justice, though he said that the government did not yet know who perpetrated the attack along the runners' route. Speaking at the White House following the tragedy, Obama said that he had contacted state and local officials to begin the process of investigating and assisting with the incident. But the president emphasized that the investigation into the causes of the attack was still in its earliest stages. "We still do not know who did this or why and people should not jump to conclusions before we have all the facts. But, make no mistake, we will get to the bottom of this," he said. "Any responsible individuals, any responsible groups, will feel the full weight of justice." On Monday evening, a White House official told NBC news, "Any event with multiple explosive devices -- as this appears to be -- is clearly an act of terror, and will be approached as an act of terror. However, we don't yet know who carried out this attack, and a thorough investigation will have to determine whether it was planned and carried out by a terrorist group, foreign or domestic." 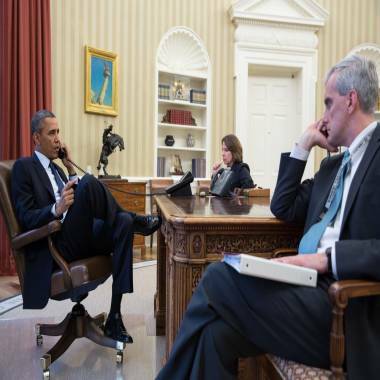 In this handout provided by the White House, President Barack Obama talks on the phone with FBI Director Robert Mueller to receive an update on the explosions that occurred in Boston on April 15, 2013. Obama was first notified of the event by a homeland security aide, Lisa Monaco, around 3 p.m. ET on Monday, according to a White House official. The president was subsequently briefed by FBI Director Robert Mueller, as well as Homeland Security Secretary Janet Napolitano. The president also spoke with state and local officials -- including Massachusetts Gov. Deval Patrick and Boston Mayor Thomas Menino -- along with leaders in Congress, briefings for whom could begin on Tuesday. The violent explosion, which Boston Police said had resulted in some fatalities and even more injuries, shook the political establishment on Monday. "Words cannot begin to express our sorrow for the families who are grieving so suddenly right now," said House Speaker John Boehner, R-Ohio, who also ordered flags over the Capitol to half-staff. "This is a terrible day for all Americans, but we will carry on in the American spirit, and come together with grace and strength." Boehner presided over the House for a moment of silence Monday afternoon. Rep. Michael Capuano, the Democratic congressman who represents Boston, spoke to the chamber, saying, "Today is a holiday in Boston, where we celebrate America and being American. I know those people here will join me in a moment of silence and hope that we can find the people who did this and bring the people to justice." Monday was Patriot's Day in Boston, a recognized holiday for the city. President Obama says he's authorized federal resources to beef up security around the country, and to assist with the investigation into the Boston marathon explosions. In the immediate aftermath of the situation in Boston, the president said he had directed the government to increase security around the United States as a precaution. Already, the White House took measures to expand its security perimeter, while the U.S. Capitol enhanced some security measures as a precaution. The administration and Congress are likely to begin the task of sorting through evidence and intelligence to determine the cause of the blasts. Rep. Adam Schiff, D-Calif., a senior member of the House Intelligence Committee, told reporters on Capitol Hill that he "wasn't aware" of any pre-existing threat to the marathon. "All law enforcement and counterterrorism units of the federal government," said New York Rep. Peter King, a senior Republican on the intelligence committee, "are doing everything possible to determine the perpetrators of this horrific attack." NBC News' Luke Russert and Kelly O'Donnell contributed to this report.